Students at Erie’s Public Schools in Erie, Pa., are big fans of their school gardens. For many Erie students, food grown and eaten through the farm-to-school program may be some of the only fresh produce they see. According to the Erie County Department of Health, more than 22,000 of Erie’s nearly 100,000 residents live in one of the city’s seven food deserts. Students and their families typically buy food at small convenience stores, Petri says. 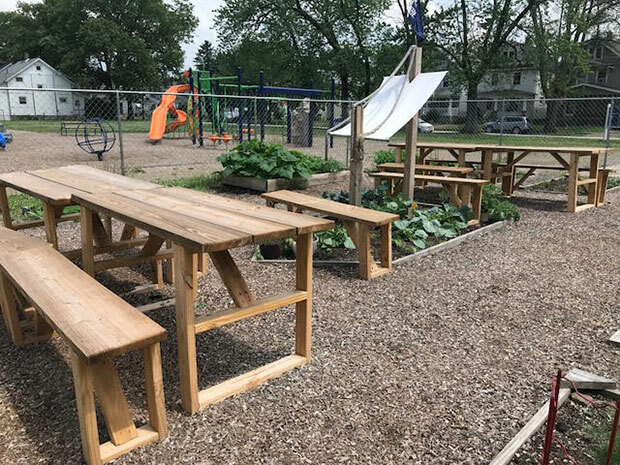 The district’s farm-to-school program began in 2013, when the district created a sustainability plan that includes the addition of two to three school gardens at schools throughout the district each year. This spring, the district will add its final garden at one of its middle schools. Once installed, each of the district’s 15 schools will have its own personal plot of land to grow produce. Earlier this year, the district and its foodservice contractor, Metz Culinary Management, received a U.S. Department of Agriculture (USDA) farm-to-school planning grant due to its success with its school gardens. Different than a USDA farm-to-school implementation grant, which provides monetary resources to districts to launch and expand farm-to-school activities, a planning grant provides funding for schools to form an action plan on how to start or continue to grow a farm-to-school program. With a garden in each school and its $23,171 USDA farm-to-school planning grant, Erie’s farm-to-school program is ready to expand again. Now that it has been awarded the planning grant, the team, made up of Petri, Jenny Johns, general manager for Metz, and other district leaders, is working on its farm-to-school strategic plan. That plan will define the district’s farm-to-school goals and how it plans on reaching them. “That plan really will direct us on how we’re going to operate in the next school year,” Petri says. After submitting the strategic plan in May of 2019, the school will then apply for the USDA farm-to-school implementation grant in the fall of 2019. When designing the plan for its farm-to-school program’s next steps, the team homed in on three areas of focus: education, procurement of local ingredients and community. Now that there will be a garden at every school in the district, the goal is to hold classes for all grade levels in the gardens. Education would also take place inside the classroom. Currently, the district has only one registered dietitian, but it is hoping to expand that number. That team would be responsible for visiting schools around the district and speaking to students about the importance of eating healthy. Due to the gardens’ small size, only a small amount of produce harvested from the gardens is brought to the cafeterias and is used for students to sample what they’ve grown. As part of its farm-to-school plan, the district’s nutrition team would work with local farmers to see if they could incorporate additional produce into the menu. Another goal for the foodservice team is to switch to a more seasonal menu. “Where we are located in Pennsylvania, the most beautiful products typically are harvested in the summer when schools are closed, so we really need to look at what is available in the fall and change our menus up so we can encourage students to eat more of our winter vegetables,” Johns says. With help from local farmers, the nutrition team would also correlate what is growing in the garden with a menu item in the cafeteria. “If they’re harvesting kale, maybe we would have a kale salad in the cafeteria,” Johns says, adding that she would also love to have cooking demos in the cafeteria throughout the year. Petri says that the intent is to have a multifaceted approach. A long-term goal includes new equipment, such as adding a steamer in each school (only a select few in the district currently have them), which Johns says will help make vegetables look more appetizing for students going down the lunch line. Erie Schools’ farm-to-school program is intended not only for its students, but also for the Erie community at large. Currently, families and volunteers who tend to the gardens in the summer get to take some produce home, and a small amount of food harvested from the gardens makes its way to the local soup kitchen. In the future, Petri and Johns would like to see more educational programs targeted at teaching students’ families how to grow their own food at home in an effort to provide easier access to healthy food throughout the district. Another focus would be to connect with more local farmers in the area to see if they could share their expertise. “The community outreach is not only us donating and helping teach people how to possibly urban garden in their homes, but also to have people come in and be community partners,” Petri says. As its farm-to-school program expands, the district will bring in local farmers and growers to talk to students, as well as host field trips so students can visit local farms. Winning grant funding for farm-to-school programs is not an easy task. “I think that it’s extremely competitive,” Petri says, adding that Erie Schools was one of two districts in the state to be awarded grant money, and that operators who would like to apply for a grant need to do their homework, such as learning about how to bring local ingredients into school meals. “I would just understand what some of the main guidelines are with farm-to-school. A big part of it that we hear over and over again … is procurement [of local food],” she says. Petri also says that operators should pay close attention to information readily available on the USDA’s website. While establishing a farm-to-school program has not always been easy, Petri says the impact it makes on students’ lives makes the whole process worth it. “Once we started this, even I, for all the years I’ve been working on projects, was surprised by how much is involved and how much work there is. But of course it’s very rewarding and very worthwhile,” she says.